George K. Butts, Water Tender 1/c, born May 2, 1921, completed high school and joined the USN Sept. 24, 1940, in St. Louis, MO. 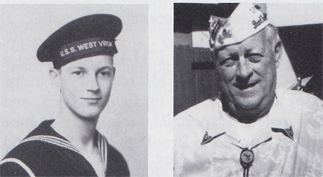 He was stationed at Great Lakes, in the USS West Virginia, Warden, MacDonough and Mercy (ATR-28). Memorable experiences include being down on the third deck where he couldn't see what was happening. He only saw a few Japanese planes when he went topside. He was discharged Nov. 25, 1946, as WTl/c. He received all the usual medals. Married June and has three children and three grandchildren. He worked for Ford Aerospace for 19 years in transportation. He enjoys golf, fishing, target shooting, photography and cap collecting.